Student of the Week - Welcome to Kindergarten! Every week there will be a Student of the Week in Room 101. 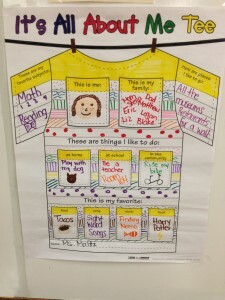 Your child will bring home a poster called, “It’s All About Me Tee”. The poster will be brought back to school on Monday (date designated on the paper sent home with the poster) to be shared and displayed on our Student of the Week Board. 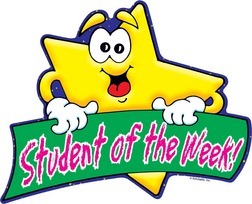 Student of the Week will be picked at random and will continue until all students have had a chance. Please talk about and complete the poster with your child. It may be completed with drawn pictures, photos, pictures from the internet or magazines, and/or words. Student of the week is a great opportunity for the students to get to know each other and for them to start talking in front of a group. There will also be a school student of the week. Every week each teacher picks one student from their class. The whole group gets their picture taken and it is up for the whole school to see.